You are currently browsing the archive for the Fiji category. The Cession Monument where Fiji was given to England. See the sloop in the background? Photo by David Lansing. Since there’s not much to do in Levuka, I spend a fair amount of time just walking about. This morning, after my usual stroll down Beach Street, I continued south of town past the wharf and tuna plant to the Cession Monument, where the Deed of Cession, making Fiji a British colony, was signed by Chief Cakobau in 1874. This wasn’t a pround moment in Fijian history. 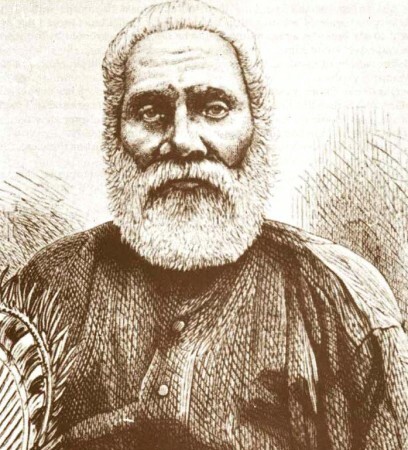 Ratu (the name for chief in Fijian) Seru Epenisa Cakobau was born in 1815 and was known as one of the great Fijian warlords. Like his father before him (the name “Cakobau” means “destroyer of Bau”), the Ratu killed this chief and that chief until, around 1865, he had pretty much become the defacto King of Fiji. In 1871, he finally succeeded in creating a united Fijian kingdom and established Levuka as the capital. The sad eyes of Chief Cakabou, once the King of Fiji. But things quickly went south. The U.S. decided that since Ratu Cakobau was the king of Fiji, he was financially responsible for an arson attack against the home of the American consul, John Brown William, on the island of Nukulau and demanded $44,000 in compensation. And just where did the Americans think a Fijian Ratu was going to come up with $44,000 in the 1870s? Of course, this was just a ruse and a way for the U.S. to assert more power in Fiji. Fearing an American invasion and annexation (just think—Fiji could have become the 50th state instead of Hawaii), Cakobau decided the best thing he could do was cede the islands to the United Kingdom. Which is how Fiji became a British colony for almost 100 years. 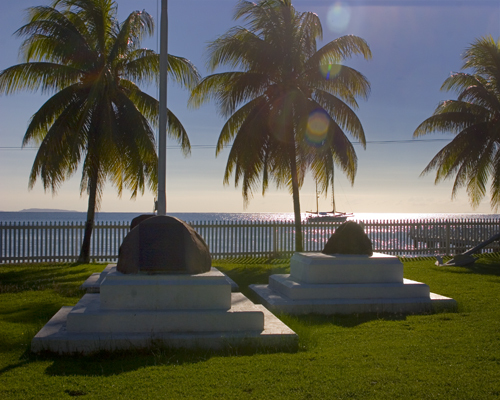 Three stones in a grassy little park near the water’s edge mark the signing ceremony that took place on October 10, 1874, as well as Fiji’s independence exactly 96 years later and the 1974 centennial celebration of the Deed of Cession. You’ll notice in the photo of these stones that in the background is the British sloop I’ve talked about—the one Meli swears is haunted. Strangely enough, I’ve seen the boat anchored at a couple of different spots along the coast while I’ve been here. But I’ve still never seen anyone on board. And no one in town has any idea who actually owns the sloop. Perhaps it’s just another sad reminder of British colonialism on the islands. Like the stones in the park. 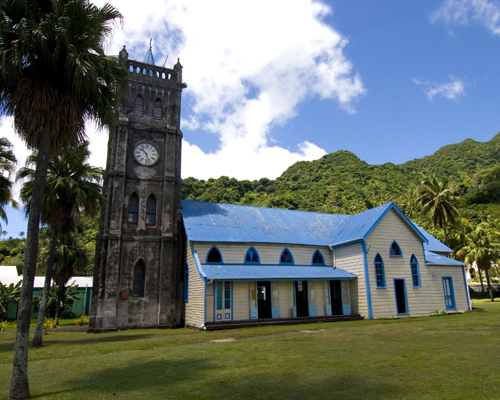 Church of the Sacred Heart in Levuka. Photo by David Lansing. If you look at the photo of Sacred Heart, you’ll see how the church has this split personality. There’s the modest tin-roofed church, looking very much like a house of worship you’d find anywhere in the South Pacific, and then there’s this rather Gothic-looking stone tower that looks like it was lifted whole from some cathedral in Europe. The clock tower was actually built 40 years after the church was raised and there are a couple of interesting things about it. First, there’s a green neon light on the stone tower that lines up with another green light farther up the hill and it’s these two lights that help guide sailors into port. Secondly, the French clock at the top of the tower, which is used by everyone in town to tell time, strikes twice at the top of the hourwith a one-minute pause in between (just in case you missed it the first time). And instead of a chime or a gong, the clock produces a sort of whimsical “thud.” Like a wooden mallet striking a hallow log. Still, I anxiously wait for it each morning around nine. Hearing the odd noise makes me feel that the day has officially begun. 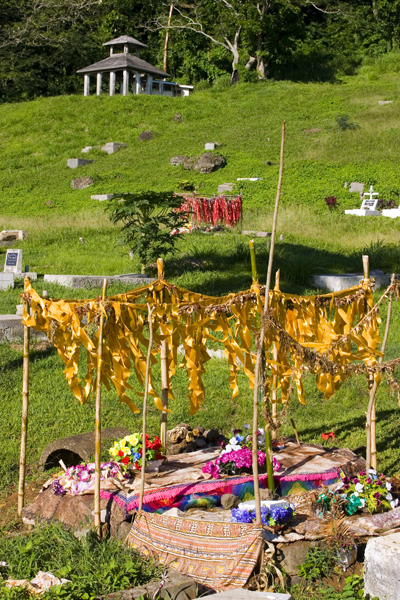 Grave of the woman who committed suicide in Levuka. Photos by David Lansing. Sleeping has been a problem this week. Yesterday I sat in a folding chair on the wooden deck of my room, the Kei cottage, a beach towel wrapped around my shoulders, watching the sun sneak up on the meaty dark clouds out over the ocean. Around six, I pulled on some shorts and headed for the Royal Hotel dining room for breakfast. And there was Meli, sitting on the steps, wearing nothing but a pair of dirty khaki shorts and sandals. His hair was matted to one side and his eyes were sunken pools of red. “I in a bad way, sir,” he said, slurring his words. He was obviously very drunk. So is it the island or is it me? I’m starting to feel like I’m the worse kind of luck here. I told Meli that I would talk to the manager of the hotel and tell him about his mother, but he should go home. “I been drinkin’ all night,” he said again. I helped him up. He was in no shape to find his way home. I took his arm and started walking up Beach Street, having no idea what direction his home might be, but fortunately one of his sons saw us and came to my rescue. They disappeared up one of the side streets behind the Marist school. And I went back to the hotel and had my breakfast: toast and two fried eggs. Afterwards, I went for a walk. Out past the fish factory and the beautiful large bure, known as the “Prince Charles House,” which was built specifically for a visit by Prince Charles in 1970 to commemorate Fiji’s independence from Great Britain. It’s the most beautiful structure in Levuka, indeed on the whole island, but it doesn’t seem to get much use. There’s nothing much past here except a few odd houses in the bush where the fishermen live. But it was a beautiful day and I had nothing I had to do so I just kept walking out along the coast road. Which is when the funeral procession passed me by. Seven, maybe eight cars, all following a pickup truck with a coffin in the back. I stood off to the side of the road as the procession slowly passed. Which is when I noticed the family from the Ovalau Holiday Resort. The man who had given me a ride into town—the dead woman’s husband—was driving the same car I’d been in. He was by himself and looked just as crazy as when I’d been with him. Behind him was a silver mini-van. I could see the mom sitting in front and the heads of many people packed in the seats behind her. They were going to bury the woman who’d committed suicide in my room. I turned around and started walking back into town. A fisherman passing by in a ratty old pickup truck stopped and asked if I wanted a ride. I thanked him but told him I’d rather walk. It was farther than I thought. I kept going around one bend after another, expecting to see the Pafco factory, but I didn’t. After awhile, I stopped and sat on a rock by the ocean watching two fishermen bring in their small boat and pull it up on the beach. They had a small bucket of fish. I couldn’t really tell what kind of fish it was, but I could see they weren’t very large. They finished up what they were doing, put the fish on a stringer, and started walking up a path that came by me. 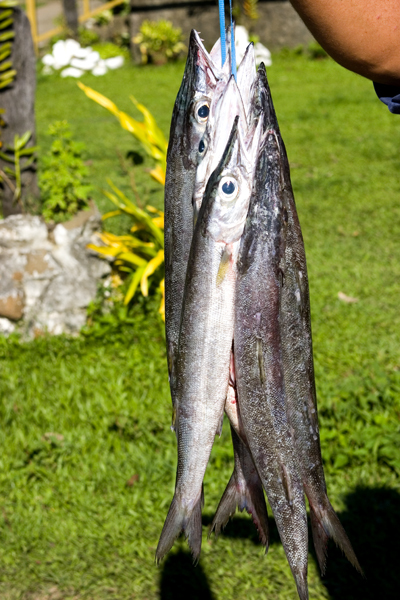 They stopped and showed me their catch—maybe six or seven smallish barracuda. God, I hate barracuda. “You eat those?” I asked them. They continued up the path towards a small cottage half hidden in the vines and bushes of the jungle. I just stayed by the ocean, looking out at the water. About a hundred yards out or so, just down the coast, I could see anchored an old threadbare sloop flying a tattered British flag. It had obviously been there for awhile. I’d asked Meli about it once and he said you could see a light come on in the sloop’s cabin in the evening but no one had ever seen anyone on deck. He said he thought it was haunted. “Fishermen stay away from that boat,” he told me. After some time, the funeral procession came by again, this time headed back into Levuka. It seemed like the mom saw me sitting there, but I couldn’t be sure. After they’d passed, I started walking back out into the country. Without thinking about it, I decided I wanted to walk to the cemetery, though I had no idea how far away it was. But it wasn’t far. Less than a quarter mile beyond where I’d turned back the first time. It was an odd cemetery, built on a hill so that you had to scramble through thick brush and over boulders to get to where the graves were scattered over the hill. I had no trouble finding the grave site of the woman who had hung herself. It was the only one with fresh flowers on it. They had lined the grave with sticks and hung banners of gold ribbons on strings stretched around the sticks. The gold ribbons waved in the breeze like seaweed in the ocean. On top of the grave, made of local rock, were little pots of petunias and pansies. Very colorful. Maybe they were her favorite flowers. Well, here she was. And here she’d be stuck for god knows how many years, wandering around the graveyard and Levuka in a sort of soulless form until she’d passed what should have been her natural age at death. And then she’d have to start all over again. From scratch. Try to get things right this time. I felt very sorry for her and told her so. And then I walked back into town. What’s left of the old Masonic Lodge in Levuka. Photo by David Lansing. We walked up the road along the large park behind the hotel where young boys are always playing soccer to the edge of the field where a small, Greek-like building stood. Or what was left of it. 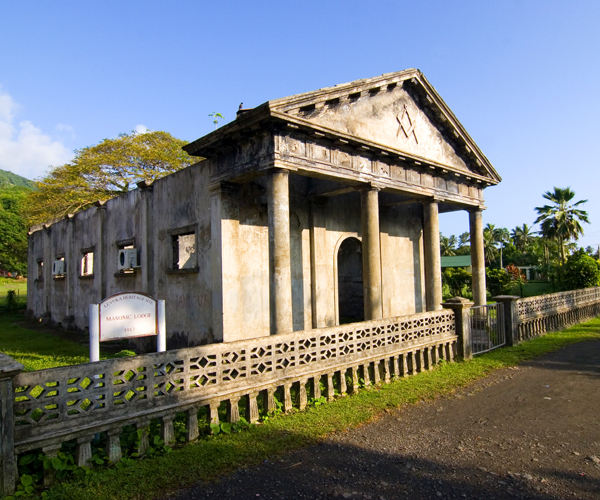 In 1875, a sailing captain named Alexander Barrack established Freemasons in Levuka and, 38 years later, built the Masonic Lodge in a classic Greek style. But not everyone in Levuka was crazy about the Freemasons. Many of the local Fijians thought there was just something a bit odd about these guys (and to think this was almost a hundred years before Dan Brown and his angels and demons). In fact, the word in town was that Freemasons were satanic and held strange rituals inside the Lodge (which would be true if you considered drinking copious amounts of gin with a bunch of other men while playing croquet to be a strange ritual). There were even stories that secret tunnels ran beneath the Masonic Lodge to the Royal Hotel or to Nasova House, near the Cession Monument, south of town. “Some say the tunnels go all the way to Scotland,” Meli told me. So even in Fiji there are conspiracy theorists. But how did the Lodge burn down? I asked Meli. “I’m coming to that,” he said. Up in the mountains above Levuka are the original inhabitants of Ovalau. They live in a little village called Lovoni and they have always been known as mean, protective, superstitious people. In fact, for years, members of the fierce Lovoni tribe would sneak into town every few years and try to burn it down, which became a bit annoying to the Europeans. They did this right up until 1871 when they were tricked into a truce and then rounded up and sold to European plantation owners as laborers (i.e, slaves). In 1875—the same year these devilish European white guys started the Masonic Lodge—the survivors of Lovoni were allowed by the British government to return to their valley but told to behave themselves. Needless to say, they weren’t too keen on white guys at that time. And still aren’t. Anyway, in 2000 there was a coup in Fiji (they seem to have one every few years, whether they need one or not) and the villagers of Lovoni, still a little pissed off from what had happened to them in 1871, marched into town with torches and machetes yelling, “Out with the devil!” and burned down the Masonic Lodge. Needless to say, they found no signs of satanic rites inside the building. Nor did they find any trace of the tunnels said to run under town. Just, you know, some Masonic symbols representing equality and mortality as well as some charred croquet mallets. Which doesn’t mean local Fijians still don’t think there’s something not quite right about the whole Freemasons business (and I’m sure they’re right). Just yesterday I came across an article in the Loyal Fijian, an independent news service “by Fijians for Fijians,” that reported that “Freemasonry extends its tentacles through all levels of society and freemasons have managed to infiltrate into the highest levels of commerce, public service, and politics. “In Levuka, where the Freemasons had their headquarters (until the lodge was burned down by 300 hysterical crazy people, the article forgot to mention), the mysterious death of Mr. Erasito has never been explained or the perpetrators brought to justice. Erasito was found completely naked behind Levuka Public School with puncture wounds to his body, after a gathering of prominent Freemasons from across Fiji and overseas. “The Police files have also disappeared as this correspondent found out when he traveled to Levuka to attempt to unravel the mystery. “After the 2000 coups, residents of Levuka burnt down the Masonic Lodge as villagers believed human sacrifices had taken place there. I wonder if Dan Brown knows about this Mr. Erasito in Levuka who ended up naked and dead with lots of little puncture wounds after a gathering of Freemasons? Sounds like a good book, don’t you think? Everything about Levuka makes you feel as if you are on a Hollywood set for a movie about life in the South Seas during Britain’s colonial heyday. Walking around my hotel, the Royal, with its century-old billard table in the bar, you half-expect to find Somerset Maugham wearing a tropical suit and lounging on the wicker furniture drinking a tumbler of Holland gin, neat. There’s only a few other people staying at the hotel at the moment. One of them is a young chap who I’ve noticed at breakfast every morning. We nod to each other when passing in the dining room, exchanging tight, constrained British smiles but never saying a word to each other. It’s very odd. 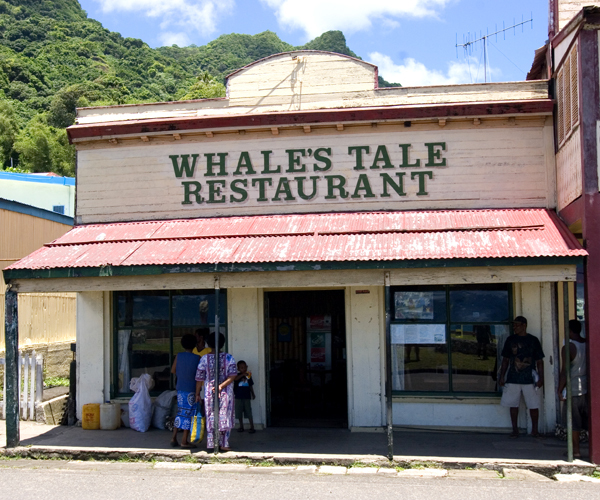 Anywhere else in the world the person dining next to you would say, “How long are you on vacation?” but not on Ovalau. Here it’s “How long do you expect to take in the local cuisine?” Which sounds like an old movie line, doesn’t it? And then he went back to his fish and chips and I went back to mine without another word being exchanged. Most nights at the Whale’s Tale there are only three, maybe four diners. All evening. Yet every few minutes, the front door opens, the old dog, lying on his side, tips his head up to have a silent look, and whoever has come in goes to the front counter holding a few bills in their hands. Without a word, the old Fijian momma who works the front takes the money and comes back with a little bag of something. I’m guessing it’s kava, that nasty tranquilizing stuff made from the dried root of a certain pepper plant. Obviously the old woman and her daughter, who cooks up the frozen fish and chips, don’t make any real money on the food side of the Whale’s Tale. Most of their income, I suppose, comes from the steady parade of kava buyers. Well, one has to do what one has to do on a tiny island like this, don’t you think?